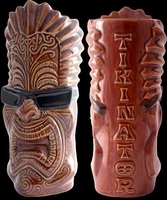 The Tikinator Tiki Mug TILT HIM BAAAACCCKK Maori inspired design - this mug is definitely one of our wildest yet. It took the talent of legendary Tiki Surf Artist Rick Rietveld to come up with this one. Stands 8 inches high and has a 20 oz. capacity.